Mercy Rand was born on March 12, 1771 in Massachusetts. Mercy died on February 25, 1858 in Waterford, Oxford County, Maine, at age 86. 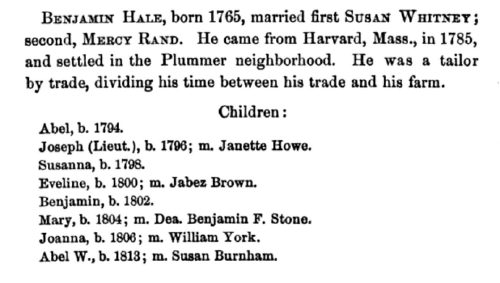 Sarah Rand was born perhaps about 1771. 1880 United States. Census Office. 10th census, 1880 federal population census, Washington, District of Columbia: National Archives and Records Service, ([19--]) , Census Place: Manchester, Hillsborough, New Hampshire; Roll: 763; Family History Film: 1254763; Page: 105C; Enumeration District: 126; Image: 0211. 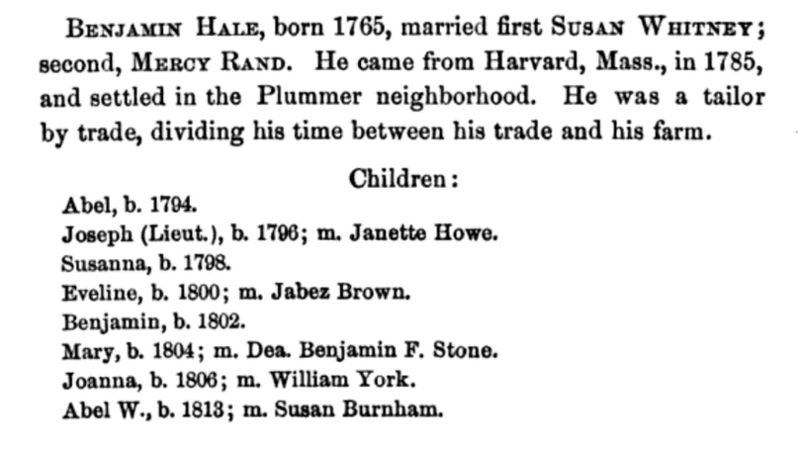 Thomas W. Baldwin, Vital records of Harvard, Massachusetts to the year 1850, Boston: Wright & Potter, (1917) , p. 297, says died 1796, at 16 months. Apparently mistook a "0" for a "6." Mary H. Woodbury left a will on September 30, 1938. FIRST: I direct my executor, here-in-after named, to pay all just claims against my estate as soon as may be after my decease. One-eighth part thereof, I give and bequeath unto the Woman's American Baptist Foreign Society of New York. One-eighth part thereof, I give and bequeath unto the Woman's American Baptist Home Mission Society of New York. Three-eighths thereof, I give and bequeath unto my step-son Wilbert M. Woodbury, and the remaining Three-eighths thereof, I give and bequeath unto my three step-grand-sons, Earl N. Woodbury, Jr., John Francis Woodbury and Leon Farnum Woodbury, in equal shares. THIRD: I hereby appoint Daniel E. Eaton of said Meredith, sole Executor of this will, hereby revoking all former wills by ME. at any time made. IN WITNESS THEREOF, I have hereunto set my hand and seal, this Thirtieth day of September, in the year of Our Lord Nineteen Hundred and Thirty-eight. Signed, sealed, published and declared by the above-named Mary H. Woodbury, as and for her last will and testament, and by us, at her request, in her presence and in presence of each other, subscribed as witnesses thereunto. "England and Wales Birth Registration Index, 1837-2008," database, FamilySearch (https://familysearch.org/ark:/61903/1:1:26YX-JR7 : 1 October 2014), Mary Anne Randall, 1859; from "England & Wales Births, 1837-2006," database, findmypast (http://www.findmypast.com : 2012); citing Birth Registration, St. George Hanover Square, London, England, citing General Register Office, Southport, England. "New Hampshire Deaths and Burials, 1784-1949," database, FamilySearch (https://familysearch.org/ark:/61903/1:1:FDKX-12P : 12 December 2014), Mary H Woodbury, 13 May 1943; citing Concord, Merrimack, New Hampshire; FHL microfilm 2,297,323. Vital records of Brookfield, Massachusetts : to the end of the year 1849, , at https://archive.org/details/vitalrecordsofbr00broo . Worcester, Massachusetts: Franklin P. Rice, (1909) , p. 178.